After working for over 30 years in the cosmetics industry, I have become an expert in creating cosmetic pencils. My background is in marketing and sales of private label color cosmetics and skincare. The idea of Graff*Etch began at Premiere in Orlando in 2009. I was exhibiting my natural eyeliner brand called Pencil Me In. At the show, several barbers appeared at the booth to purchase my eyeliner pencils. It turns out that Major League Barbers, Nieves Almaraz, and Charlie Lopez were creating designs with their clippers and wanted to use my eyeliner pencils to color in the designs. The hair art looked amazing!! At that moment, I realized I had to sell pencils for hair. Initially I thought my eyeliner pencil brand would be perfect for hair art. What I discovered is even extraordinary cosmetic pencils do not meet the special requirements for coloring in hair art. Regular pencils do not work like Graff*Etch. Do not be fooled by inferior brands that may look like mine. Graff*Etch was created to combine graffiti art and barber etchings. Hair Art was once considered a fad but has now become as main stream as tattoos. 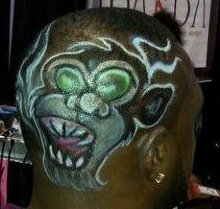 When barbers and stylists create hair art, they are creating a design in the hair with their trimmers & razors. These designs can be geometric, sports and company logos, cartoon characters and even famous faces. Graff*Etch pencils were created for newly shaved sensitive skin formulated to apply on a tender scalp and in the hair. Each pack contains 8 seven-inch pencils with a sharpener built into each cap. The formula is blend able so any color you need can be created from those 8 original colors. Use these pencils to pre-draw your design before etching them out. You can fill in hair lines, beards and create sharp angles with these pencils. Our pencils have the proper combination of texture, long lasting wear and ease of application. Graff*Etch pencils apply creamy smooth, won’t drip down if you sweat and will stay-put until you wash it out with shampoo or a cleanser. 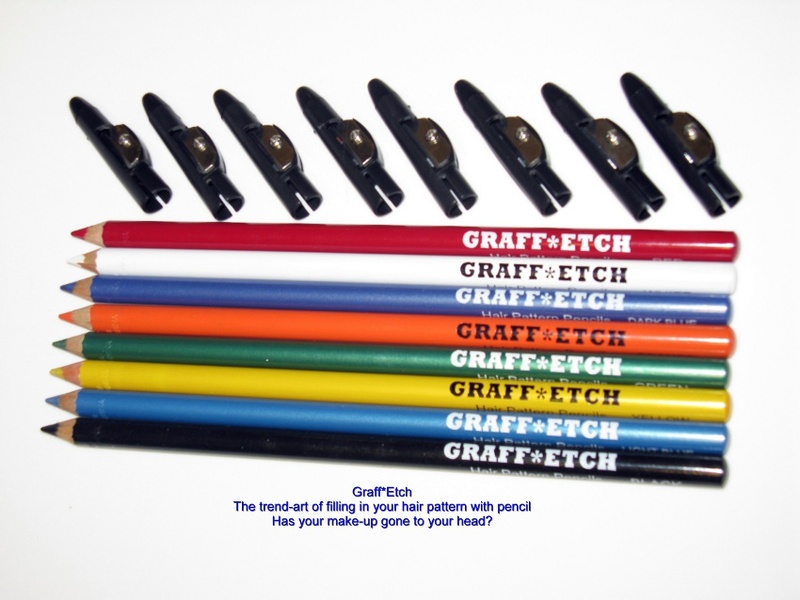 Graff*Etch pencils were made because barbers and stylists need proper tools to be more creative. It's a fun and temporary way to express yourself. What is the difference between eyeliner pencils &GraffEtch Hair pencils? There are huge differences in pencils and that makes all the difference. blendable on short hair and the scalp. 2. Colors are vibrant and show up on all hair and skin types. 3. Color is waterproof and sweat proof yet removes easily with shampoo. 4. Built-in sharpeners help with drawing fine lines and precision. 5. Pencils are fragrance free. 6. Pencils are Paraben and petroleum free. 7. Cost is less than $4 a pencil. 8. 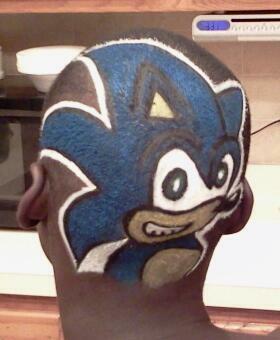 First choice among barbers and stylists that do hair art. 9. Seeing the Graff*Etch name, takes the guess work out. You can trust the formula to perform for your hair art needs. 1. These pencils can irritate a newly shaved scalp. 2. Eyeliner pencils are made to stay where you put them. 3. Eyeliner pencils don’t show up vibrant enough. together to create a third. sensitivity or making the color last. 6. Linda Eisner, owner of Graff*Etch has an eyeliner pencil brand. After barbers experimented with her pencils, Graff*Etch pencils were determined to be far superior. All cosmetic pencils are made for different applications so you never really know what you are getting. Application Tip: Try applying Xotics Jamilla as a base after haircut and before you apply color. Colors will glide on smoothly, appear more vibrant & you use less pencil. After color is completed, lightly spray with spritz to seal color & hold. Barbers and stylists are designing patterns into the hair with edgers already. Kids young and old are having designs etched into their haircuts for their sports teams; leaving the school letter and number on their heads. Women are joining in and asking for their hair to be buzzed down one side of their head, sometimes underneath a cute haircut for a funky yet flexible look. They are requesting designs like stars, hearts, & even lightening bolts. Filling in these designs with colored pencils really makes the design stand out! It's a temporary way to express yourself. The color washes out and the hair grows back. Each 8 piece set of Original colors contains one each of: Black, White, Red, Green, Yellow, Orange, Dark Blue and Light Blue. The pencil colors can be layered and combined to create any shade you require.The pencils are sold in 8 piece sets.